Studies show that responding to new sales leads promptly, literally within minutes, can have a dramatic impact on the rate at which those leads are qualified, and the speed at which they convert to opportunities and, ultimately, deals. An effective lead follow-up strategy, therefore, is essential to ensuring that you’re getting the most from your investment in demand generation. 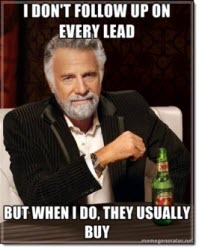 Unfortunately, no matter how motivated or well-trained or highly compensated your sales reps, relying on a sales force alone for lead follow-up is almost guaranteed to mean some leads fall through the proverbial cracks. One reason is that sales bandwidth ebbs and flows, so, for example, if you return from a trade show and dump 3,000 leads into your CRM system, you can bet that some of those leads aren’t going to hear from anyone in sales for days or weeks, if at all. Secondly, reps will chase those leads that they deem to show the highest potential, and delay follow-up to (or ignore altogether) those leads that experience tells them aren’t as likely to yield short-term deals. Trade show badge scans and white paper downloads are prime examples of leads usually relegated to the back of the follow up queue. 1. Don’t try to do too much. In most cases, the goal of an effective autoresponder program isn’t to convince the prospect to buy your product, or even to persuade him or her to request contact from sales. A good autoresponder simply generates response, any response, and gives the prospect another opportunity to request additional information. By doing so, the program collects additional information about each prospect, and allows your sales reps to prioritize follow-up to those individuals with the greatest or most immediate interest. 2. Incorporate multiple touches. By all means respond as quickly as possible when a lead enters the system, but then follow that initial touch with one or two additional emails over the next few days. A good rule of thumb is 0-3-7: a first email sent immediately, a second sent after 3 days (giving the prospect time to review the content he/she viewed or downloaded, perhaps), and a third sent after a week (as a reminder). There’s no concrete rule for frequency, however, so adapt and test the intervals based on your specific audience, lead source, and sales process. This article originally appeared as a guest post on Optify’s Lead Generation Software Blog. This entry was posted in B2B Marketing, inside sales, Lead Management, Lead Nurturing, Sales 2.0 and tagged autoresponder campaign, autoresponders, lead follow-up, lead generation software, Lead Management, Lead Nurturing, Optify on March 13, 2013 by Howard Sewell.